We had been feeling dejected after an extremely trying day of lessons in Laos, but with those words by fellow team member Noel, we were reminded of the unwavering optimism and purpose our team set off with on the very first day. The past couple of days had been anything but easy. 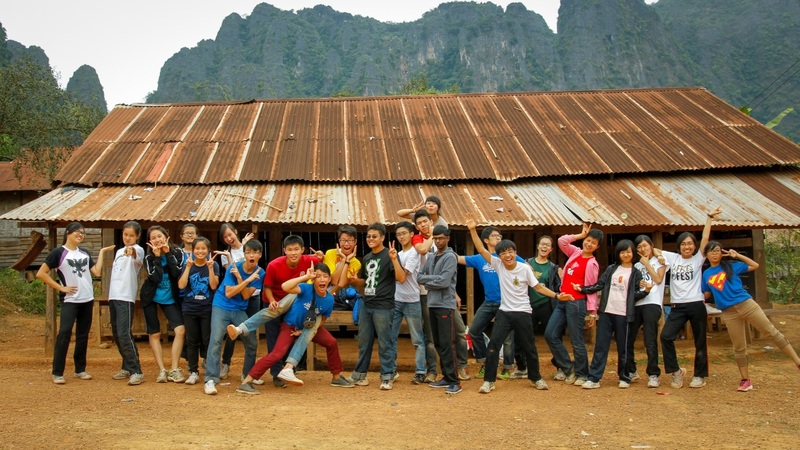 From 18 November to 1 December, our 23 member strong ISLE team, together with our 2 mentors, embarked on a service learning trip to Laos. Our main objective for the trip was to construct the walls of a new school located in Pa Bong village near the Laos Capital of Vientiane. We also aimed to teach the village schoolchildren basic conversational English as well as provide Arts, Science, Math, Song and Dance as well as Sports sessions. Everything had gone smoothly during our planning stages before the trip. However, on the first day of lessons, it became glaringly obvious that the language barrier would be a huge obstruction to our teaching. The prior research we did on conversational Lao we compiled were seemingly for naught as our untrained tongues were hopeless at trying to enunciate the subtle nuances of the Lao language. This was just one of the many instances that the language barrier made it difficult for us to convey important points to the children. It took some time for us to get across the message to the Primary One children that they were meant to say their own name after ‘Hello I am’, but they caught on after we demonstrated repeatedly with some of their names as examples. The classroom was eventually filled with a happy chorus of children excitedly introducing themselves to each other in English. Even though this problem was finally solved, it showed how difficult it was for us to communicate effectively to the children and have more meaningful interactions apart from saying ‘Sabaidee!’ which meant ‘Hello!’ and ‘Di!’ which meant ‘Good!’. We were often left feeling frustrated with our inability to express ourselves and this affected our morale. Thus, Noel’s words served as a reminder that giving is also about receiving. The children were all smiles and good cheer even when it got difficult to understand us. It was heart-warming to note that the children appreciated our efforts at reaching out to them by being very attentive and enthusiastic during lessons. Too often, we take for granted the ease at which we communicate with our peers in Singapore. We lose ourselves in the technological language of emoticons and emojis; so much so that we tend to forget how much more it means to receive a smile and a nod to signify understanding from someone. For example, the euphoria you feel over something seemingly simple- such as when a 6-year-old boy realises what you meant when you’d pointed at your red shirt and repeated ‘Sii daeng. Red!’ for what seemed to be the hundredth time. Construction was by no means an easy feat either. Wall-building was certainly a test of physical strength and endurance, skills which most of us were unfortunately lacking in. We built a total of 10 brick walls for the school perimeter as well as dug 6 knee-deep holes in the ground to install foundational pillars. This seemingly straightforward task took a total of 10 days. It might not sound like much work, but the 23 of us can testify that it is in fact harder than it appears to be. We spent day after day digging and stabbing at tough soil, mixing cement, laying and hacking bricks. Our guide in Laos was a young, witty fellow named Joy. He was our main translator and took care of us throughout the entirety of the trip. He also worked at the construction site and helped with the school-building project. Joy taught us how to mix the cement in the right proportions and how to lay bricks in the most effective way possible. However, even after all the coaching, the 23 of us combined still could not match up to Joy in terms of speed and quality when it came to construction. No amount of textbook-memorising or practising could prepare us for the perseverance it took to soldier on and ensure the correct alignment of our bricks and the proper amount of cement used. It was truly a humbling experience to find out that we could not even do a task like placing a brick straight and in place without failing several times. All work and no play make 23 restless teenagers! One of the highlights of the trip was definitely cave exploration. On the weekends, we delved deep into the caves of the magnificent mountains we saw every day while talking morning walks. Apart from caving, we also went rice harvesting. We were lucky, as harvesting was perhaps the best part of the entire rice farming process. We hacked away in futile effort at the rice stalks for the first 10 minutes, struggling with our inexperience. Eventually, we got the hang of it and things went much faster. The team managed to clear 2 plots of land in 3 hours. We finally understood what our parents meant when they said ‘every grain of rice symbolises the sweat and tears of the farmers’. It was the liveliness and excitement of the kids that spurred us on the most throughout the trip. We had to significantly modify our lessons and water them down to match the comprehension level of the children, which also made us feel increasingly disillusioned- who were we to take up 3 hours of their time every day, teaching them things that could be taught in their native language in half the time by their teacher? Still, the bright smiles of the children never wavered and this enabled us to soldier on. It warmed our hearts, knowing that the children valued our interactions. It is easy enough to delude ourselves into thinking that we are doing the children a favour but we have to take a step back and think about whom are the ones truly benefiting from these lessons. Was it the children who listened intently as we struggled to communicate our lesson content across or was it us as the supposed teachers, learning the values of patience and sincerity from the ever-enthusiastic children? Farewell was difficult but inevitable. The kids rode upon our shoulders and clambered onto our backs. We tried our best to explain what was going on with the minimal Lao we could manage. ‘La Khon (Goodbye!) Bai Liao Singapore (Go back Singapore).’ Some of the more alert kids nodded with understanding but for the vast majority, our words did not register. It didn’t matter anyway- none of us were ready to face the reality of the situation and continued to enjoy the company of the children while we still could. If there was one important lesson that living in the village taught us- it would be the significance of living in the present and enjoying every single moment of it. When we don’t spend our days bogged down by the worry of numerous deadlines and commitments awaiting us in the future, we learn to appreciate the things bringing us joy in the current situation that much more. I learned that we can’t go for service learning trips with the sole objective to give as much as possible to the host community. Sometimes, we have to learn to take a step back and receive. 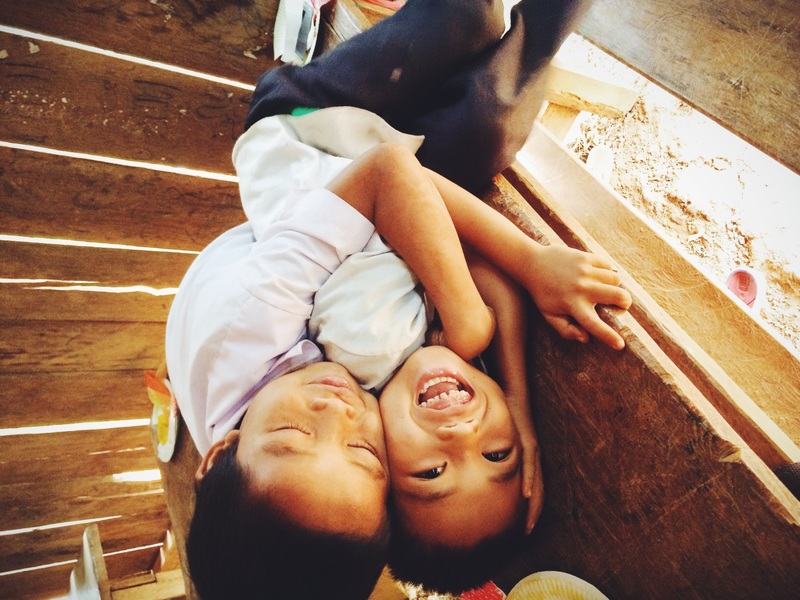 The Laotians have so much to share- their openness of heart, vibrancy of spirit and warmth of affection. These are things that may not be so readily available back at home. Perhaps the fullness of our lives may not necessarily be best measured in the amount of high-class delicacies we consume or the frequency of exotic holidays we go on. Who’s to say that buying 20-cent juice boxes with your classmates after school and going farming with your parents on the weekend isn’t an equally fulfilling life? Teaching them basic conversational English would surely benefit them, yes- the next team that does service learning in the village will also stand to gain from the slight ease in communication and the kids will too find it easier to bond with the volunteers. We can come up with numerous lessons and plans on what to teach the children next, but sometimes none of those things are as important as the gift of friendship and love that we were so fortunately bestowed with. Hopefully, the children and the villagers feel the same way about our exchange. ‘Tomorrow, Hao Mai may wake up without a hulking foreigner to cling to, Sabia won’t have anyone’s bum to slap and Hao Kom will probably remain the same genius as always, look out the classroom and wonder where we went. Maybe it’ll make a difference to them- but then again, another team will eventually come and maybe it won’t. I only know I’m happy to have touched their lives, happy to have made the friends I’ve made, chased the sunset with them, made 75 bags of rice that will taste like Singaporean hands, bathed in that little smoky toilet and played with the children of Pa Bong. As we were leaving the village, I tried to recall some dramatic, life-changing experience, but all that came to mind were memories of villagers waving from their porches, children running and playing on the roads with sticky rice in hand as ducks waddled frantically out of their way. All that came to mind was the view of the sunset bathing everything in its orange magnificence. All that came to mind was the cheeky look on 7-year-old Hao Nat’s face as he hugged my arm while saying goodbye on the last day of class. It will be these fleeting moments that weigh the heaviest in my mind, all coming together to form a meshwork of experiences and lessons that I will carry with me in the days yet to come.